The Russia Only articles are a series of short stories about Jeroen's experiences of living and working in Russia over the past 25 years. This Russian saying used to apply to the daily business practice of foreigners doing business in Russia in the nineties. A regular business meeting at around eleven in the morning could take an unexpected turn when your host would close the door behind you after you entered the room. With the door closing something else would surely be opened, and that would be the drawer of your host’s desk, out of which, a bottle of Vodka, and if you were lucky, some dark bread would be produced. Two hours later, at around lunchtime, you would be trying to find your way back to the office dressed in a smart suit and tie, but hardly being able to put two straight steps in front of each other, blow, in the twenty first century, the risk of running into a bottle of Vodka during a time of the day when your mind can only say “Cappuccino” is not so big anymore. Luckily, Russia’s drinking culture has evolved in the last 20 years. Where in the nineties the saying “Have a drink in the morning and you are free for the rest of the day” (s utra wiypil, ves den svoboden) applied, nowadays, it is “sdelal delo, gutyay smelo” (having done your business, you are free to party). Still, Vodka is an important part of the Russian culture, and therefore, of Russian business culture. The farther you are from Moscow, the sooner this will become clear to you. Drinking Vodka is unavoidable in Russia and the best policy is: “if you can’t beat them, join them”. And join them you will, sooner or later because saying no to a Russian who offers you a drink is like trying to avoid death or taxes. You may delay it a little, but in the end, it will catch up with you. And if you drink, it is important to understand that it is not only what you drink that is important, but also how you drink. Shots of Vodka are not drunk by little sips. They go down the hatch in one go. You are allowed though, to loudly express any kind of emotion after you have downed a shot of Vodka. Delight or suffering may be expressed by groans, gurgles and other noises, just as long as you do it with conviction. You may eat a pickled cucumber to soften the feeling of a vodka-burned throat; alternatively, if you want to show your worth, you simply deeply sniff a crust of brown bread. This may seem tough in the beginning, but you will notice that after three shots of Vodka it is actually not that bad. The first shot is just as tough for the Russian as it is for you, but the difference is that the Russian’s genetic memory harbours the knowledge that it gets better after two or three shots. Contrary to popular belief, it is not necessary to drink bottle after bottle. Everything from five shots (or 250 grams) and more will do the trick. If after five shots you stop drinking, that will be respected. But you are free to continue of course. 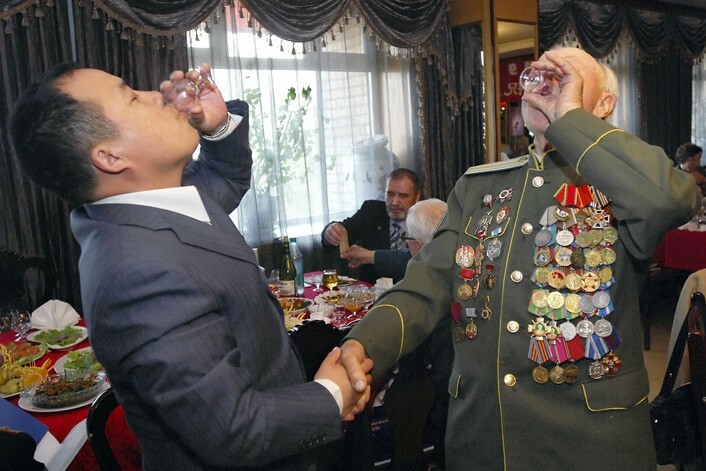 The Vodka drinking is nothing less than a ceremony, with its own specific etiquette. Every glass you drink will be preceded by a toast and you will be expected to say a few of them. A good toast is highly appreciated and the third toast (standing up) is always proposed to the ladies present. A glass can only be poured when the glass is standing on the table (as opposed to holding it up in the air); an opened Vodka bottle is not closed again and empty bottles are taken off the table. One rather dangerous moment is when your Russian host starts drinking ‘na pososhok’ (one for the road). Although you might: think that he is delicately trying to get rid of you, the ‘pososhok’ is actually more often than not, the start of a long line of drinks for the road. But these are just few of the customs that rule the drinking table. Drinking Vodka is an important part of doing business, although, no business is usually done during the drinking. Something much more important takes place while you progress form one glass to the other. A personal relationship and trust are being established; two crucial ingredients for successful business in Russia.